Meccano Meccanoid 2.0 Just $87.97! Down From $139! 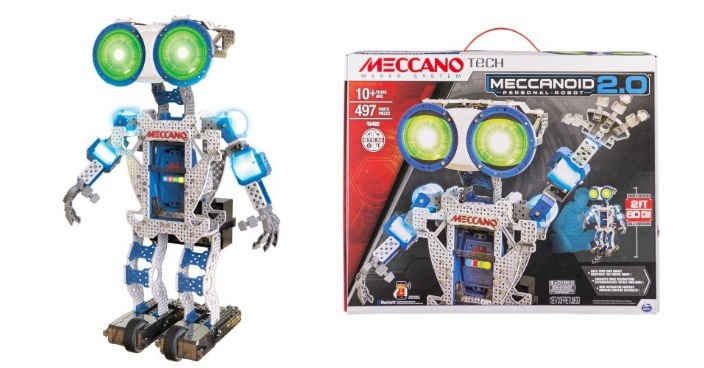 You are here: Home / Great Deals / Christmas Deals / Meccano Meccanoid 2.0 Just $87.97! Down From $139! Right now you can get this Meccano Meccanoid 2.0 for just $87.97 (Reg. $139) at Walmart! Meet your personal robot Meccanoid 2.0! Build Meccanoid 2ft tall with the included real tools and durable plastic pieces. This personal robot features 6 motors for realistic movement, and voice recognition. Meccanoid 2.0 has 3 innovative ways to program: Learned Intelligent Movement, Ragdoll mode Drag and Drop programming on a smart device (device not included). Plus, Meccanoid knows over 3000 pre-programmed phrases, tells stories, and knows robot trivia. Meccanoid 2.0 is your new robot best friend!